Whether you smoke weed everyday like Snoop Dogg or simply take a few tokes a day, there comes a time in most cannabis consumers’ lives where a tolerance break is in order. If you’re a regular cannabis consumer, let’s be real. After smoking weed on the reg, day in and day out, you’ve likely experienced a bit of burnout. We’re not going to lie, we’ve been there ourselves. This is exactly why we’re firm believers in taking a THC tolerance break from time to time. What exactly is a THC tolerance break? And why do people take one? What is a THC Tolerance Break? A THC tolerance break (tolerance break or t-break for short) is just what it sounds like. It’s the deliberate practice of taking a break from THC to clear the body and mind from the effects of the psychoactive cannabinoid. Medical cannabis users take t-breaks when their usage of cannabis is providing diminishing returns. What this means is that their cannabis use is no longer providing them with the positive effects it was in the past. The same thing can happen to non-medical cannabis users as well. Is this because regular cannabis consumers actually build up a tolerance to the effects of herb? A 1995 article published in High Times, Marijuana and the Brain, Part II: The Tolerance Factor, highlighted a 1993 study that looked at chronic cannabinoid administration in rats. Six different groups of the lab animals were given either CBD, THC, a synthetic cannabinoid, or a placebo, where changes in behavioral responses were then compared with changes of density in six various areas of the brain. Keep in mind, the study was conducted in 1993…a time when weed didn’t even come close to as strong as it is today. Regardless, the study found what many cannabis smokers already know. It was discovered that the body adapts to the ingestion of large amounts of THC by reducing the number of cannabinoid receptors available in the body. This reduces the effects of the psychoactive cannabinoid over time. As a heavy consumer’s body adapts to these changes in the endocannabinoid system, they won’t continue to feel the same effects of cannabis. Basically, the more pot you smoke, the less high you get. Welcome to the number one reason why many heavy cannabis consumers choose to take a tolerance break. If you smoke weed regularly, you know that chronic cannabis consumption can put a serious dent in your drive. Burnout is real, especially amongst those who are heavy cannabis consumers (those who are borderline dependent). Think you can’t become dependent on cannabis? Think again. We’re not talking being addicted to weed like one might be to heroin or cocaine. A dependency to cannabis is usually different than the extremes people imagine when it comes to drug addiction. We’re talking dependency, which has shown to be most common in adults that average 10 years or more of almost daily use that have made serious attempts to quit at least six times. If any of these sound familiar, it could be time to take a tolerance break. Note: a tolerance break from THC is for a person who is not addicted to cannabis but just needs a break. If you or your loved one are struggling with addiction to cannabis, consider seeking professional help as you may need more than just a tolerance break. Here’s something else to consider when possibly considering a THC tolerance break. Research indicates that there is a reduction in dopamine levels where excessive cannabis use is concerned. What is dopamine responsible for, exactly? The neurotransmitter plays a major role in regulating behavior, mood, sleep, and cognition. It’s associated with reward and motivation, as well as creativity and decision-making. A 2017 study found that heavy users of cannabis produced significantly lower levels of dopamine than light users or those that don’t use at all. What exactly does this have to do with taking a tolerance break? You know that burnout feeling that comes with smoking weed all day every day? Dopamine plays a big role. The neurotransmitter is something responsible for how much effort is needed to complete a task and what the rewards are. People with higher dopamine levels are more apt to take on activities that demand energy. Low levels of dopamine are known to cause decreased motivation, lack of interest in life, procrastination, fatigue, mood swings, inability to experience pleasure, interrupted sleep patterns, and more. What are the effects of recurrent THC consumption on the endocannabinoid system itself? Doesn’t THC work in harmony with the body’s natural endocannabinoid system to inspire homeostasis? It’s possible and as more science comes out, we will know for sure. But too much of anything isn’t necessarily always a good thing. When it comes to homeostasis, it all depends on how much THC is consumed. We mentioned earlier that consuming large amounts of THC reduces the number of cannabinoid receptors in the body, which reduces the effects one feels. Research indicates that when someone consumes THC day in and day out, it produces excessive and prolonged stimulation of the CB1 receptor, which is speculated to disrupt endocannabinoid function. It’s also been suggested that overstimulation of the CB1 receptor is something that could lead to THC-induced psychosis. If someone is a chronic cannabis consumer, could taking a THC tolerance break actually help reset endocannabinoid function? Could consuming less THC help those who’ve thrown their endocannabinoid system out of whack by consuming too much? Tolerance can become so affected by chronic consumption that even taking a huge dab won’t even cause an effect in some of the heaviest smokers. Research into the complexity of cannabis and how it works with the body is still in its infancy, however, is increasing exponentially with each passing year. Until then we have mostly a lot of anecdotal evidence to rely on. Ask any heavy consumer what stopping for 7-10 days does and they’re likely to tell you that taking a while off weed resets their system and restores their tolerance levels. Think it’s time for a t-break? If you’re someone who could benefit from a tolerance break for whatever reason, we’ve compiled a few tips to get you through the time it takes to reset your endocannabinoid receptors so you can resume your love affair with Mary Jane. I think everyone who’s ever said they’re going to take a tolerance break knows about the whole mentality of “weed’s not addictive, I can quit whenever I want” mentality…but when it comes down to actually doing it, they realize it’s harder than they might’ve expected. Here’s the thing, though. Anything you do day in and day out is going to be difficult to stop doing. This goes for being glued to your cell phone 24/7, drinking coffee every day, eating, and all the other things you do on a daily basis. Our bodies and minds crave that which is familiar. Keep this in mind on your tolerance break. Even after a few days when that voice creeps in to remind you of how much better life is when you wake and bake…do your best not to listen. Weed will still be there in the mornings when your tolerance break is over. Just make sure you go in knowing it might not be as easy. But it can be done. And you’re likely to thank yourself when it’s over. Talk about a whole new level of appreciation. Heavy consumers may want to consider cutting down gradually before cutting out THC cold turkey. Pick a date you want to start your tolerance break and begin cutting down your consumption a couple weeks beforehand. Cutting down gives your body and endocannabinoid system time to adjust and makes actually “quitting” for a bit a far easier process. If you’re someone who likes to smoke in the morning, start to skip out on the weed first thing. Wait until mid-day, and over the course of a couple weeks get to the point where you’re only taking a couple hits before bed. Trust us. We speak from experience. Slowly cutting down and giving your body time to adjust is MUCH easier than quitting all at once. When it comes time to actually stop consuming cannabis altogether, it’s vital to remove all your cannabis and everything associated with it either out of the house or out of view. The whole “out of sight, out of mind” thing is something to really keep in mind when you’re taking a tolerance break. Consider moving everything into the garage or another room in your house. This includes any flower, concentrate, oil, papers, pipes, bongs, dab rigs, and the like. It’s pretty easy to stay tempted when you can see your favorite bong staring back at you. Whether in your house, car, or wherever else you’re privy to stashing your stash…get rid of it. If you can’t trust yourself not to get it out of its hiding spot, give it to a friend to hold onto for you until your tolerance break over. If you’re a regular cannabis consumer, your first t-break can be strange. There’s suddenly such a different perspective of time. Sometimes you’ll feel this rush of energy that can make you feel like you don’t know what to do with yourself. During your THC tolerance break, it’s important to stay busy. Take up a new hobby, organize that closet you keep putting off, engage in some arts and crafts, do whatever it is you’ve been thinking about doing but possibly put off because you were high all the time. Not only will this keep your mind occupied, but can is also an awesome way to create new habits. When you do start consuming again, you can bring these new habits with you (because any regular consumer knows that weed makes doing something you love just that much better). While taking a THC tolerance break isn’t as easy as it might sound at first, staying committed to doing it can be more rewarding than you might think. You will be tempted to consume during the time you take a break. Do yourself a favor and don’t give into these urges. Stay focused and understand that the discipline it takes to keep your commitment will have a significant impact on all areas of your life. You’re not quitting cannabis for good. You’re just taking a break. When it’s over, you’ll realize just how worth it the break really was the first time you light up. How Long Should a Tolerance Break Last? When it comes to taking a t-break, everyone is different. Some might need just a few days to reset the system. Our last tolerance break was just shy of two weeks. Chronic consumers who smoke all day, every day might want to consider taking a month off. World renown podcaster and cannabis enthusiast, Joe Rogan and his friends do a “Sober October” every year. They take a month off weed and alcohol as a healthy reset. You know your body better than anyone. The whole three weeks/21 days to form a habit is always a good rule of thumb to follow to get you started. Can CBD Help with a Tolerance Break? What about taking CBD during a THC tolerance break? Maybe. We still need more research on this and CBD in general but there’s plenty of anecdotal evidence on this one. THC and CBD react differently in the endocannabinoid system. THC binds directly to the CB1 receptor in such an adept manner that this binding affinity has been referred to as a “lock and key” system. CBD, on the other hand, has zero binding affinity with CB1 or CB2 receptors. Instead, the non-psychoactive cannabinoid uses indirect means for regulating the endocannabinoid system to bring a state of homeostasis back to the body. According to neuroscientist and endocannabinoid expert Dr. Ethan Russo, CBD is a “endocannabinoid modulator.” This means that CBD helps regulate the endocannabinoid system and restore overall balance to the body and brain. That being said, CBD could have a significant impact on the endocannabinoid system during a THC tolerance break. While more research is warranted, CBD could be beneficial when taking a tolerance break. While limited, we do have some data which shows that CBD can be helpful for marijuana and other addictions. Anecdotally speaking, we know that taking a few hits of a CBD preroll here and there helped us immensely during a recent tolerance break. Incorporating CBD into your tolerance break could help with the lack of focus, anxiety, or poor sleep you might feel when taking a break from THC. Medical marijuana users find that CBD can be helpful as an alternative for some of the symptoms they were previously using THC for primarily. Whether it’s vaping, smoking CBD flower, or taking a tincture, CBD could be of significant benefit during your break. At CBD School we are nerds for all the data we can get. Have you used CBD during a tolerance break from THC? Was it helpful? Please tell us about it in the comments section at the end of this article! Think a tolerance break might be in order? If you’re not feeling the same effects from THC as you used to or have discovered you’re experiencing a bit of burnout, a tolerance break might be in order. The endocannabinoid system can get overloaded from overconsumption of THC and stop functioning in the most ideal manner. 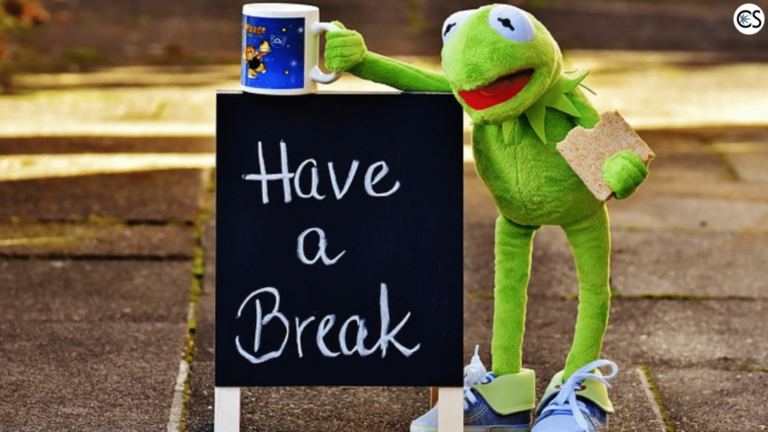 Taking a break could reset the delicate balance of the endocannabinoid system so tolerance levels resume and you’re once again feeling elevated. CBD could help the whole process during a t-break by encouraging overall homeostasis to a system that’s otherwise out of whack. CBD can also provide relaxation or alleviation of symptoms. Whether your tolerance break lasts three days, a couple weeks, or a month or more, one thing’s for certain. When you return to consuming cannabis, you’ll have developed a whole new appreciation for the way it makes you feel. Have you taken a THC tolerance break before? We’d love to hear your story it in the comments below.